Both men's and women's races of this very first event of the new year were very tight. The men's race had looked like a start-to-finish victory for Britain's Lazloe Boden until the last 300m. After having led for 41.9km, he was finally passed by 46-year old Markus Von Gunten who had been in fourth place before catching Paul Moog and Joerg Schiller and then targeting Boden. 42-year old ultra marathoner Carmen Hildebrand won the women's race by only 49 seconds. It was her first victory in six attempts, having finished 2nd, 3rd, 4th and 5th in previous editions. Peter Kamais of Kenya and Ethiopian Ashu Kasim cruised to victory in the first major marathon of the year writes Mirko Javala. Good conditions (cloudy, 14°C and light wind) and a strong men's field combined to topple the year-old course record set by Kenyan Robert Kipchumba. The 27-year-old defending champion was one of the favourites. A slow start (30:41 at 10km) picked up so that by 16.5km there were ten men left in the leading group. Little changed as Dickson Chumba led through 20km in 1:01:15, but then he stepped up the pace to under 3 minutes/km between 20-23km. Steadying thereafter, a group of eight passed 30km in 1:30:45. Then he kicked again, and only Solomon Tsege was able to follow. At 31km these two were about 10m ahead of Kamais and Kipchumba, but Kamais soon got back behind Tsege as Kipchumba fell back. Tsege was then dropped leaving Kamais and Chumba chasing the win as they passed 32km in 1:36:39. After passing 35km in 1:45:33 Chumba tried another move leaving Kamais momentarily, but at 36.5km the veteran Kamais, 35 years old and running only his fourth marathon, was right back behind him. After 37km Kamais took the lead and by 38.5km he started to pull away so that by 39km he was 540m clear. He went on to lower his personal best by almost 2 minutes and set a new course record. The women's race lacked the best Chinese except for 25-year-old Wang Jiali who was the early leader but faded after setting too ambitious a pace. The Ethiopian duo Merima Hasen and Ashu Kasim led through halfway before Kasim started to build a lead she would not surrender. She lowered her previous best of 2:25:49 from Paris 2009 by almost 3 minutes. Contested under the best weather conditions since its first running in 2004, the ninth edition of the Marathon witnessed relatively cool temperatures (19-24°C) throughout the race. Pacemaker Simon Kismili and Tanzanian Dickson Marwa led a group of twenty runners in the initial stages. After 15km (45:20) as they entered the 5km Sea Link, John Kyui took up the running. By 20km (1:01:43) the group was down to seven, with James Moiben now leading. At 29km the Kenyan trio of Moiben, Kyui and Nixon Maschichin had only Ethiopians Gela Hailu and Raji Assefa for company. The timings had been consistently a minute slower than course record pace, but picked up slightly and Assefa and Maschichin dropped back. The lead trio entered the last kilometre together, with Assefa straining to get away. Moiben hung on and then launched his attack which proved just enough to win, although Assefa was clawing him back in the final metres and ended up only a metre behind. In the women's race Nestanet Abeyo led a group of six through 20km in 1:09:19 before making her move after 25km. Increasing her tempo on the return journey she went on to clock a personal best and course record time, more than four minutes clear. Ram Singh Yadav, first among the Indians and 12th overall in 2:16:59, achieved the "B" standard for the Olympic Games. The second Indian in the fray, Elam Singh, missed the norm by just 27 seconds. Singh, a steeplechaser, ran his first Marathon less than three months ago where he finished second in 2:24:50. India's last entry in an Olympic Games Marathon came in 1980 at Moscow. The best placing in the Olympics by India was that of Shivnath Singh's 11th position in Montreal, four years earlier. In the Maui Oceanfront Marathon whales are always just offshore waiting to give runners a glimpse of a fluke or a spout. Being in the 50th state of the USA many runners are "collectors" completing their quest to run all 50 states, but many of these come back each year for their Maui vacation marathon. Chuck Engle from Oregon won his second MOM while female winner Mari Kauri is a well-traveled Finnish athlete who now resides in China. Runners come to vacation in Maui and just happen to run a marathon, or a half, or maybe a 15K, 10K, or 5K with the whole family getting to pick a race or walk to suit. 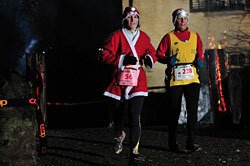 Whichever you choose, it will be one of the most beautiful races you will ever do. Ayele Abshero, just 21, ran the fastest winning marathon debut in history and set a new course record, making him the fourth fastest man ever, writes Pat Butcher. 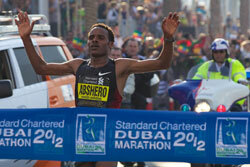 Abshero headed an Ethiopian clean sweep, with both other finishes being personal bests. Jonathon Maiyo was the only non-Ethiopian in the top 10, most of whom set personal bests. A relatively sedate start, followed by gradual acceleration took over thirty men to halfway in 1:02:22. That group only further reduced past 30km, after which the top five finishers relayed the lead until Abshero made his break close to 40km. 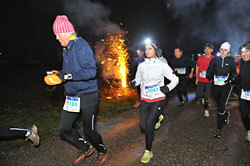 In perfect running conditions (12°C) fourteen men went under 2:08, and nine women under 2:25. An elated Abshero said: "I'm now the number one in Ethiopia, and I think it could be the Olympic Games for me". Aselefech Mergia defended her women's title, running a national and course record, but finishing only three seconds ahead of Kenyan debutante, Lucy Kabuu. Six Ethiopians finished in the top ten. While the men's leaders ran a faster second half, the women's pace was fairly even. A group of nine reached halfway in 1:09:42. Like Abshero, Mergia said: "I'm now the best Ethiopian, and with a time like that, I hope to be selected for the Olympic Games". She also won the world's biggest marathon prize of $250,000 (women and men) for the second year in succession, and won the first marathon in which three women ran sub-2:20. Risa Shigetomo upset race favourite Kayoko Fukushi to win the 31st edition and take a step closer to Olympic qualification writes Ken Nakamura. Fukushi lost contact at 26.5km and eventually finished a disappointing 9th. Pacemakers did an excellent job and led six runners clear by 5km (16:55). Irene Mogaka dropped from the group, which passed 10km in 33:48 and 15km in 50:35, at which point Naoko Sakamoto lost contact. After 20km Azusa Nojiri, a former cross country skier, seemed to have been dropped as the leaders went through halfway in 1:10:58. Now without any pacemakers, Shigetomo led Fukushi until 26.5km at which point she started to break away, covering the 28th kilometre in 3:20 and then running alone through 30km in 1:40:52. Behind her, Nojiri, and then the Ukrainian Tetyana Gamera-Shmyrko passed Fukushi. Shigetomo slowed between 30-35km, with a 17:01 split, but stayed far ahead of Nojiri, who succumbed to a late run by the Ukrainian and was overtaken on the track of the Nagai Stadium. With only one Japanese Olympic qualifying race left (Nagoya Women's Marathon on March 11th) Shigetomo is the strongest candidate for the Olympic team, followed by Yukiko Akaba (5th in Daegu) and Ryoko Kizaki (winner of the Yokohama Women's Marathon). Mizuki Noguchi pulled out of Osaka and will run in Nagoya along with Yoshimi Ozaki, the second finisher in Yokohama.